Except that the process still requires the waiter to walk back to the till to confirm that it had been processed and we weren’t about to walk out of the restaurant having pretended to pay the bill! A handheld device that updates the table’s bill status in real time must be the next development. Another electronic payment innovation launches today. Paym allows the transfer money between people with a minimum fuss. It relies on you registering your mobile phone number against a bank account. Then rather than juggling sort codes and account numbers you simply enter a friend’s mobile number into your bank’s app (or select it from your contacts), specify the amount (up to a daily maximum of £250) and press send. It works between banks so should be fairly flexible as support widens. Nine UK banks launched their support for Paym this morning: Danske Bank (that's their personal banking director Tony Wilcox with finance minister Simon Hamilton in the photo), Barclays, Halifax, HSBC, Lloyds Bank, Santander, TSB, Bank of Scotland and Cumberland Building Society. Locally, the Ulster Bank are expected to support Paym later this year; Nationwide Building Society in early 2015. Paym is the next step in the move from cash and cheques towards a cashless society. Paym is also part of banks reinforcing that the smartphone in your pocket and computer on your desk are taking over many of the facilities that used to be solely offered by physical bank branches and hole-in-the-wall machines. Be in no doubt that Paym is as much about the banking industry introducing efficiencies (ie, cost savings) at the same time as offering innovative customer service. The last of four recorded Thought for the Days that were being broadcast on April Sunday mornings just before the 8am news in Kim Lenaghan's programme. A few years ago I interviewed Oscar the Grouch. You know, the grumpy, green hairy creature who lives in a trash can on Sesame Street. For over 40 years the man inside puppets like Big Bird and Oscar has been Caroll Spinney. He had brought Oscar over to Belfast to take part in our local children’s TV production Sesame Tree. I chatted with Caroll for a while and then he reached under the table and reappeared with Oscar. And so began a surreal ten minutes of conversation with the shaggy puppet. Grouch by name, and grouch by nature, Oscar likes to grumble. He prefers broken things to objects that work. Mmmm. His grouchiness didn’t seem to be turned up to eleven. Either Oscar was suffering from jetlag or he was secretly more mellow than he liked to let on. I think, deep down in his trash can Oscar the Grouch understood this. Despite his negativity, begrudgingly he knew to look for the positive. Then I asked Oscar my killer question: “You’re grouchy, you’re a hoarder, you like a nap, I’ve got to ask, are you related to my wife?” Caroll gave me a wry smile and I hastened to add that the question originated with my wife. He gave me a signed photograph to take home to her! Maybe I could learn from Oscar. This is the third of four recorded Thought for the Days that are being broadcast on April Sunday mornings just before the 8am news in Kim Lenaghan's programme. Inspired by an early Sunday morning in September 2013. It was dawn on a Sunday morning. The bedside clock said half five. I tossed and turned, becoming more and more aware of a sharp discomfort in my right side. Below my ribs, it was sore. Sore in a place that shouldn't be sore. I melodramatically announced to my wife that I was going to drive myself to Casualty. By the time I reached Broadway the pain had become more acute. Triaged and given a couple of pain killers which might as well have been Smarties, I sat a while on the uncomfortable plastic chairs violently jiggling my leg, before pacing up and down the waiting room like a caged animal. My groaning must have sounded like a mother in labour. My name was called. The doctor listened to my gasping explanation of the symptoms and nodded his head. "I bet it's kidney stones" he said. "You sure? Not my appendix?" "Nah, totally the wrong place. I had them a few years ago. Agony. Let’s get you something for the pain and then I'll prove it's stones." Pain killers were injected into the line in my hand, a saline drip went up and the acute pain along with the I'm-going-to-die feeling began to subside. An X-ray showed a stone, just a few millimetres in diameter, blocked on its way to exit my body. Tablets would widen the tubes, and more tablets would manage the pain. I should go home to bed and see if it would clear. And later that day it did. I was lucky. I walked in and walked out of Accident & Emergency. A painful episode, but short-lived and curable. But while I hung around the waiting room it took such effort to lift my head and see the other people around me. An older couple sat holding hands, the lady in her dressing gown, her partner ashen with concern. People sleeping off hangovers in the entrance porch. Ambulances bringing urgent cases into A&E. A young man with a badly cut face brought in by his mother. Ambling around like a wounded bear I tried to pray for my fellow sufferers ... and myself. I don't think I finished many sentences in my on/off pleading with God. Their backstories were unknown, but their need for relief, reassurance and results was obvious. It wasn't all about me. In the midst of all our own pain, it is sometimes possible to think of others besides ourselves. To some we can offer direct assistance and reassurance like my doctor did with me; for others the least we can do is to pray on their behalf and ask God to intervene. Somehow for me the discomfort and the remaining pain vanished. Just like that. One tiny stone had moved away. Freedom from pain. Christ has risen. He is risen indeed. The third last sentence “Freedom from pain” is deliberately ambiguous! In one sense, the small stone moved and I was free from pain. I’d be quick to point out that Christianity doesn’t offer instant freedom from pain in this life. Though I might argue that in an eternal timeframe it does. 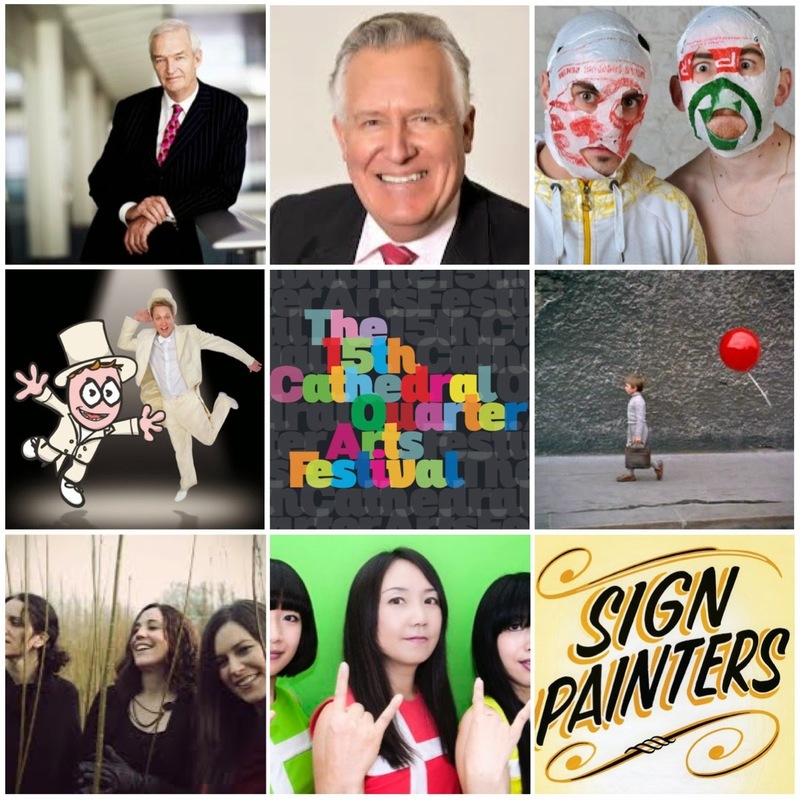 Having heard Jon Snow speak before in Belfast, I can strongly recommend the opening event of the 15th Cathedral Quarter Art Festival on Thursday 1 May with the Channel 4 News presenter's lunchtime talk in The Black Box. £8 including lunch. Six hours later Peter Hain will step onto the stage in the Waterfront Studio. His period as Secretary of State for Northern Ireland between 2005 and 2007 came back to prominence recently with his role in the On the Runs process. Expect him to address that as well as giving his perspectives on South Africa where he grew up, and commenting on Israel and Palestine. £10. Rubberbandits – Continental Fistfight. The plastic-bag wearing music/comedy duo bring their brand new musical straight from its critically-acclaimed, sold out run in London to Belfast for two nights. The Black Box on Saturday 4 at 7.45pm; The MAC on Monday 5 and 7.45pm. £10. Dr Seuss Does Yoga! A “joyful introduction to the practice of yoga in a relaxed and playful way” with fun yoga postures accompanied by Dr Seuss tales. Flow Yoga Studio in Hull Street at 11am. Admission free (donation only). Tenx9 is a monthly night where nine people have up to ten minutes to tell a real story from their lives. The theme for this CQAF event is love/hate. The Black Box Green Room doors will open at 7.30pm. Admission free, but limited to first 75 people to arrive. More details on the Tenx9 website or on twitter. I last heard the Henry Girls back at Out to Lunch 2011 when they performed alongside The Fox Hunt. They’re back with beautiful harmonies and harp, transcending Irish folk and Americana. Beautiful music. The Black Box, 8pm. £10. An Instinct For Kindness is Chris Larner’s solo performance about assisted suicide and his journey to Dignitas in Switzerland in November 2010 with his chronically ill ex-wife. Upstairs at the Mac at 8pm. £8. The Unluckiest Arab in Belfast is Mac Premo’s one man play which promises to “look into the tension between life’s looming questions and minute details, told through a series of stories from his own life”. The Belfast Barge (unlicensed, bring your own) on Monday 5, Tuesday 6 and Wednesday 7 and 8pm. £7. North Belfast-born author Bernard MacLaverty talking in The Black Box at 1pm. Lamb, Cal, Grace Notes, The Anatomy School, and more. £6 including lunch. Little Howard’s Big Show For Kids sees (human) Big Howard being his animated six-year-old Little Howard off CBBC and into The Black Box at 4.30pm for stand-up, live animation, jokes and songs. Big Haward has been diagnosed as clinically unfunny and there’s a slug in the backstage toilet … and now a sinister figure has arrived so they need a good show to keepo them out of jail. £5. Comedian, journalist, novelist and activist Robert Newman performs his stand up show New Theory of Evolution in The Black Box at 8pm. He’ll explain why DNA is not destiny while throwing in female buffalo voting and Richard Dawkin’s postman wrestling naked! £10. Howard Read’s Stand-Up Animator will combine live comedy with animation in The Sunflower Pub at 8pm. £6. Getting To Know … Duke Special is part of a regular series at the Oh Yeah Music Centre and will “explore the songwriting impulses” of one of Belfast’s most versatile artists. 8pm. Free, but email info AT ohyeahbelfast DOT com to reserve tickets. Formed in Osaka 33 years ago, Shonen Knife visit CQAF on the occasion of the release of their 20th album. An all-female, thrashy, Japanese, girl-punk band who toured with Nirvana. The Black Box at 9pm. £9. The Kid’s Noisy Cinema – The Red Balloon is back in Belfast at 1pm in the Flow Yoga Studio in Hill Street. It’s a beautiful story of a boy who discovers a red balloon. The young audience will play percussion and add movement to the spellbinding film. Ages 7-11. £4. CQAF Ride and Seek is a scavenger hunt riddled with magic, music and comedy within the Cathedral Quarter. No bike required. But for most fun, form a gang and win some prizes. Meet at Cotton Court at 2pm. Admission Free. #CQrideandseek for photos and videos. Two NI film premieres at the one event. Sign Painters (80 mins) captures and craftsmanship of signwriters who hand-letter storefronts, murals and billboards, a trade that’s experiencing a renaissance in spite of die-cut vinyl lettering and inkjet printers. That’s followed by K (16 mins) which documents the relationship, history and influence of hand painted signs in Dublin. Flow Yoga Studio in Hill Street at 3.15pm. £3. Mark Ellen – Rock Stars Stole My Life in The Dark Horse at 6pm. Working at NME, Smash Hits, Q, MOJO, The Word, Radio One and Whistle Test, Mark will “tell tales and settle scores” and “put a chaotic world to rights and pour petrol on the embers of a glorious industry now in spirally decline”. £4. Moondance: The Van Morrison Project features “exquisite Irish language versions of Van Morrison’s songs” translated by poets Cathal Póirtéir and Gabriel Rosenstock. Ré-Dhamhsa: Tionsadal Van Morrison is performed by Liam Ó Maonlaí, David Blake, and Hilary Bow, with support from the Brad Pitt Light Orchestra and stunning screen projections of the lyrics created by Margaret Lonergan. A great way to spend a Sunday afternoon in The Black Box. 2pm. £10. A Better Boy sees Ian McElhinney play the part of William J Pirrie (chairman of Harland & Wolff) in a 1917 interview in England about his nephew Thomas “Tommie” Andrews, the chief designer of the Titanic. Covering the building, the sinking and the inquiries, “his version of events are in conflict with the received notions and judgements still in place a century after”. Upstairs at the Mac, 8pm. £8. 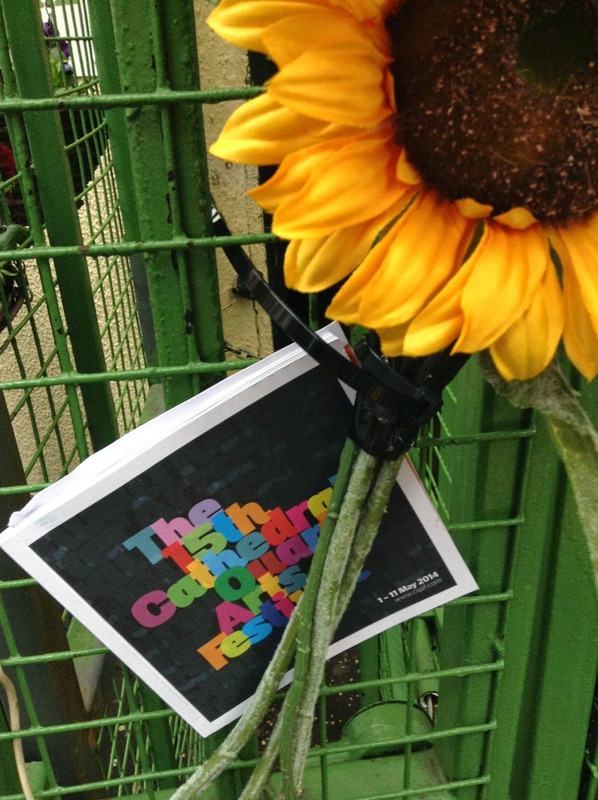 Lots more in the CQAF programme. In parallel with the Cathedral Quarter Arts Festival, the outdoor, often acrobatic and always comical Festival of Fools will be taking place. Barry Cullen is filling the PS2 space at the top of Donegall Street with sensors and sound making devices for Noise Box V1. You can visit Wed-Fri 1-5pm and Sat 11am-3pm between 21 April and 10 May and help influence the process-based performance by your presence. So too will be the volunteer-driven un-festival The Open Source which is back in Cathedral Quarter from 1 to 11 May with one hour sessions during afternoons and evenings. More details as they emerge on the website and tagged with #OSBelfast. New route between Belfast City & Doncaster Sheffield airport; but who remembers the much smaller Sheffield City airport? A recent email from Belfast City Airport about a new route to Robin Hood Doncaster Sheffield Airport caught my eye and reminded me about travelling through the much smaller Sheffield City Airport in the early 2000s. 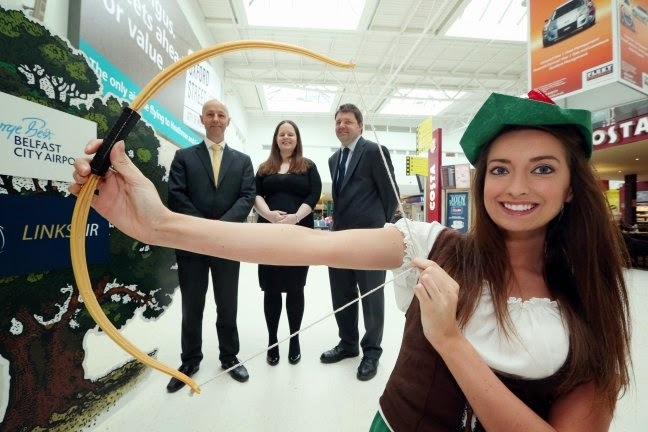 LinksAir’s new route is between Belfast and Robin Hood Doncaster Sheffield Airport (Monday-Friday twice a day, and early evening on Sunday). It’s a relatively small airport (with 690,351 passengers and 11,197 take-offs and landings in 2013) and is dwarfed by Leeds Bradford (70 minutes drive north west) and Belfast City Airport. But it’s very convenient to Sheffield at a little under 20 miles to the east of the city centre. Originally the site of RAF Finningley, it was converted to a commercial airport in 2005. With a long runway it was one of the Space Shuttle emergency landing sites in the event of a Transoceanic Abort Landing. I remember travelling home through Sheffield Airport one evening about five or six years ago. The conveyor belt at the side of the check-in desk didn’t move. Instead a man in overalls appeared and lifted my small case and carried it over to a door, went outside and loaded it by hand into the hold of the small aircraft. Later, he held the same door open as a handful of us walked out to board the aircraft. And before the plane taxied back from its stand, he had changed into a fireman’s uniform and was heading towards the airfield’s fire truck. An airport with so little traffic that it didn’t have a radar! No surprise that Sheffield Airport ceased business at the end of April 2008. The route between Belfast City and less compact and bijou Doncaster Sheffield started flying on Friday 11 April. Thought for the Day - Palm Sunday - What is real worship? This is the second of four recorded Thought for the Days that are being broadcast on April Sunday mornings just before the 8am news in Kim Lenaghan's programme. 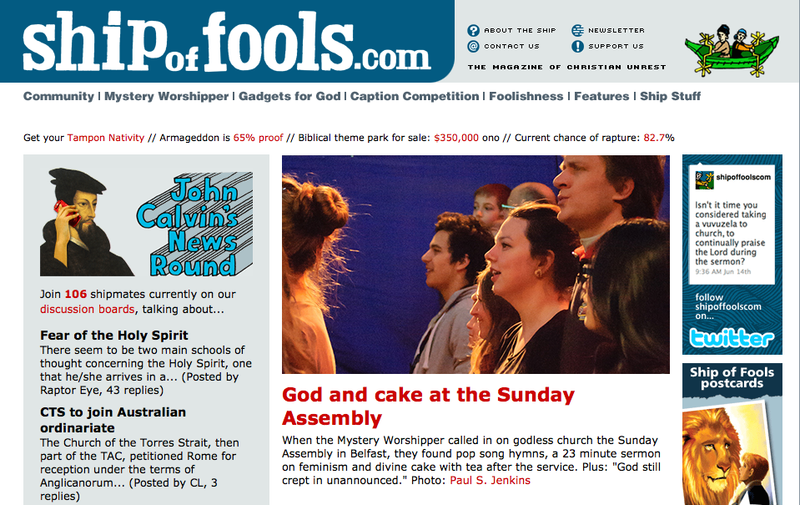 It's partly based on my observations at a gathering of Sunday Assembly Belfast just over a month ago. It was so nearly based around the divine cake they served at the end until I spotted a bumper sticker while driving home from Ballymena. 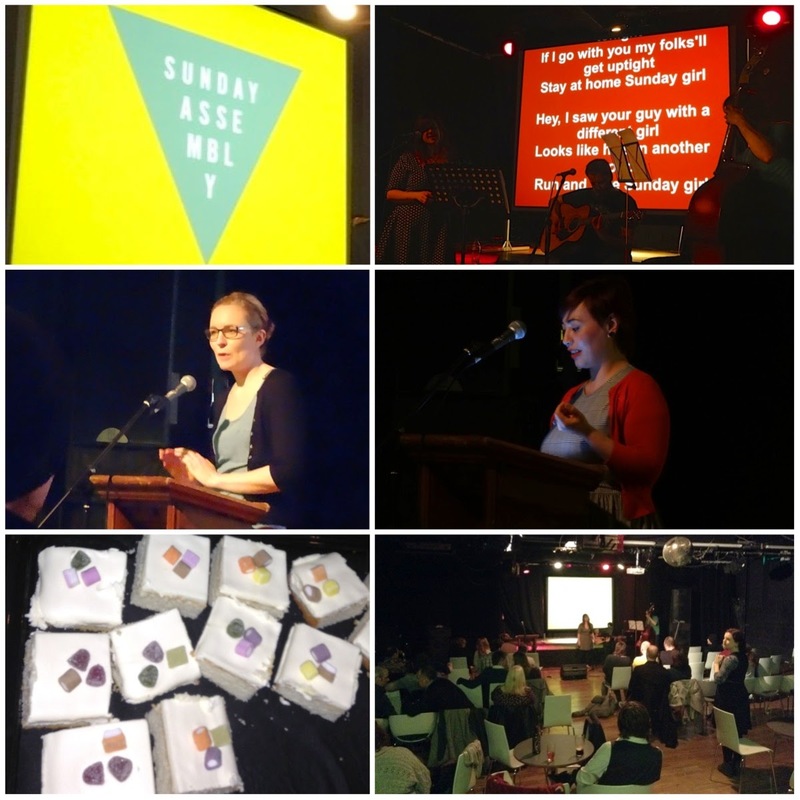 Recently on a damp Sunday afternoon I gathered with 40 or so other people in a dimly lit venue in Belfast. Some like me had come on their own. Others in groups. Younger couples brought small children. There was an enthusiastic welcome and announcements were made. A small band that was assembled at the front played a song. The lyrics went up on a screen and we were gently encouraged to sing along. A 23 minute illustrated address was delivered by a well-spoken woman standing behind a carved wooden lectern. A collection was taken. And there was more singing. Church, but not as you know it. You see, one of the songs was Blondie’s Sunday Girl! And the address was about “the Suffragette movement in Ireland and what we can still learn from it”. Franchises of Sunday Assembly are popping up all around the world. It’s not intentionally anti-religious and the Belfast organiser stressed that they weren’t hung up on atheism. As a regular church goer – from before I was born – I was curious to see what this Godless service would be like. Would Sunday Assembly feel like church? Could God really be banished? It was a deliberately secular humanist space, albeit with plenty of inherited ecclesiastical references. People gathered together where they could celebrate life through song and word; and where they could be open to challenge about the issues being discussed. God was not being worshipped. And yet God was definitely not absent. Unannounced God was still at work, in me at least, through the challenge of building a fair society and even the mindfulness exercise near the end – a practice not unfamiliar to some churchgoers – which was a very natural opportunity for quiet, meditative prayer. Driving along some time later I noticed a car with sticker in its back windscreen saying: “Liverpool is my religion. Anfield is my church.” Cheering on the terraces can so quickly be replaced with chanting for a manager to be sacked. This is Palm Sunday and as Jesus entered Jerusalem the crowd was cheering for him, when they thought he was going to overthrow the occupying Roman regime. Yet days later when he preached a different agenda, attacking the religious authorities and valuing the wrong sort of poor and downtrodden, the crowd turned and called for his crucifixion. Comradeship on the football terrace isn’t enough for me. Nor is just getting together with likeminded souls for a shared experience on a Sunday morning in church or an afternoon at the Sunday Assembly. Where you worship isn’t what matters. Who and how you worship does. Are you worshipping yourself, a team, a tribe? Or are you wholeheartedly worshipping the God that created us and gives us the strength to endure and maybe even forgive the oppressive forces at work around us? 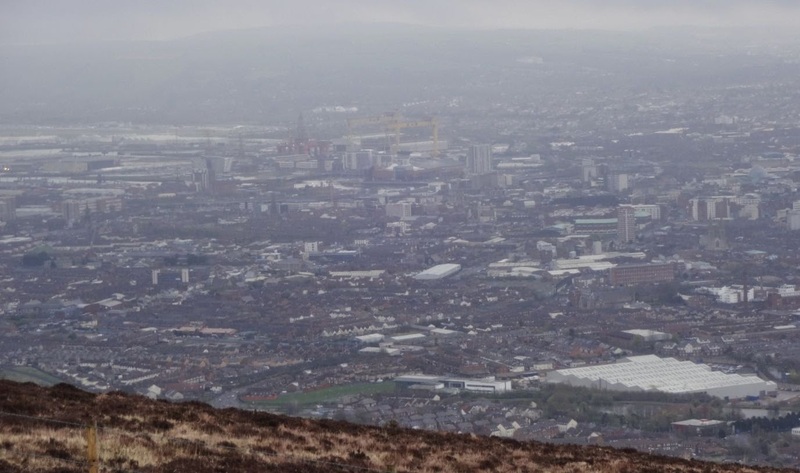 While the Belfast Hills dominate the landscape, looking over the city, I’ve spent very little time exploring them. 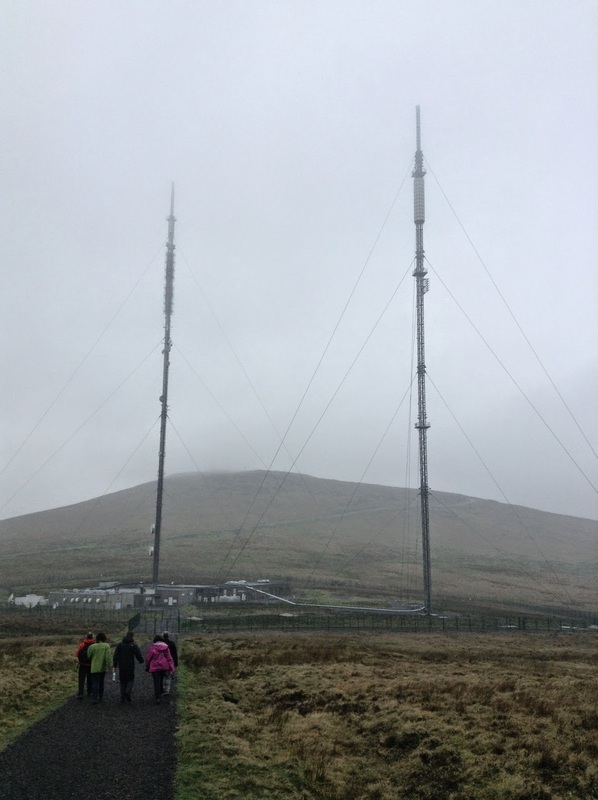 Today I headed up to the Divis Road and the new Ridge Trail that was being launched by Outdoor Recreation and the National Trust. 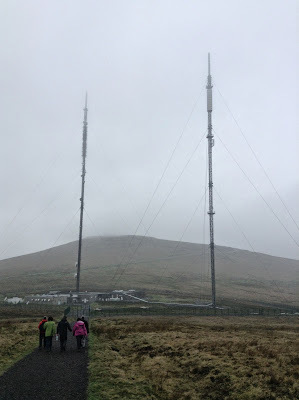 During the Troubles, much of the mountain top was off limits to all but the military. But with its purchase by the NT and the development of over 10 miles of maintained pathways across the top of Divis and Black Mountain, the area is no longer inaccessible and is open to locals as well as tourists wanting to get a bit of exercise and check out the stunning panoramas over Belfast and County Down. 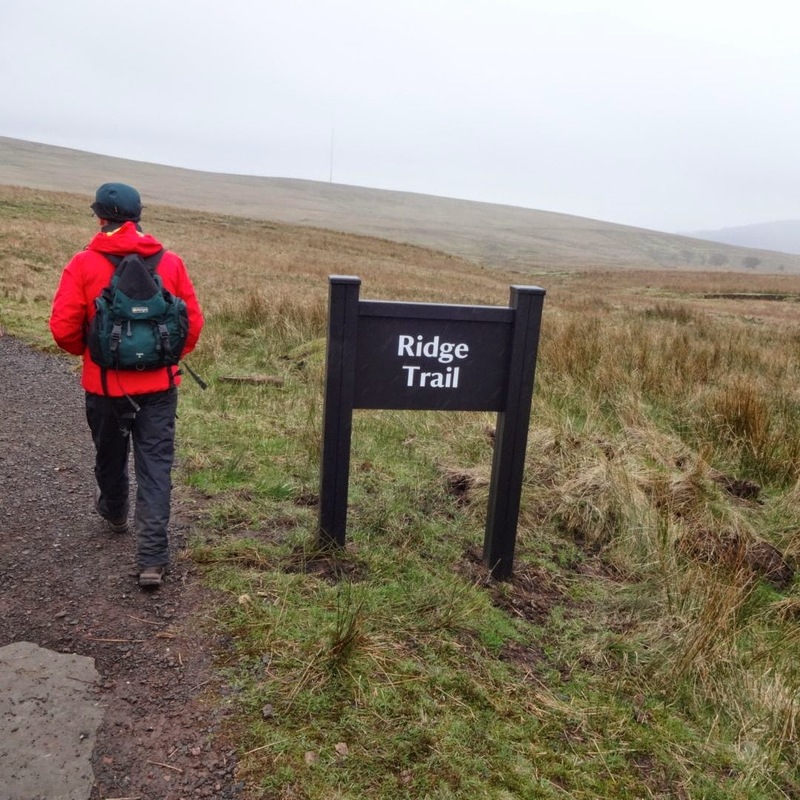 The new Ridge Trail is a gentle and circular 4.2 mile walk over gravel, limestone slabs, board walk and a short section of tarmac. It’s not at all steep, and even though it was fairly overcast this afternoon, the views were stunning. There is a complete absence of traffic noise and the normal sound of city life. Yet down below – even on an overcast day like today – you can make out landmarks stretching from Lisburn to Belfast city centre, the shipyards, and beyond. Allegedly on a clear day you can see Scotland, the Isle of Man and Cumbria from the highest point. The circular viewing point just below the Black Mountain trigonometry point/standing stone helps set the scenery in context. 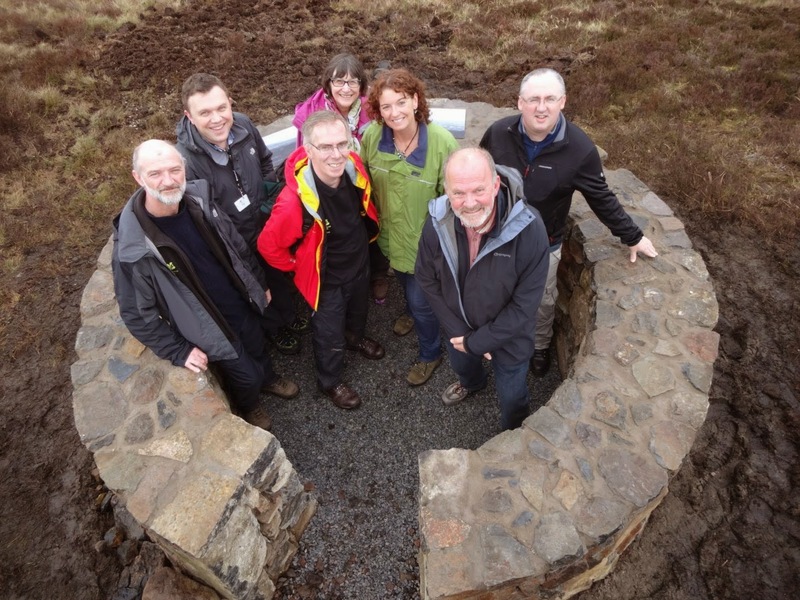 Outdoor Recreation NI (WalkNI.com) developed the trail, with funding from the Department of Agriculture and Rural Development (through the Lagan Rural Partnership), NI Tourist Board and the National Trust totalling £459,700. At the launch, the phrase “tourism is now more important than agriculture” was quoted several times. NITB CEO Alan Clarke spoke of the focus on attracting tourists to Northern Ireland for short or additional holiday breaks, and the need to be able to offer outdoor pursuits as well as urban activities. 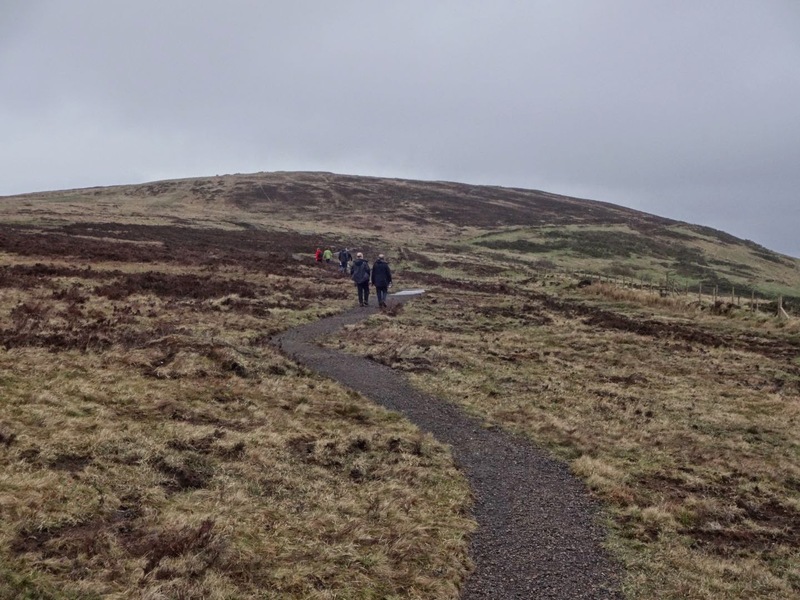 The NI tourist portfolio still faces difficulties with Sundays, evenings and public transport … though the trail is open all week long, will be great for a summer evening walk, and the number 106 bus from Europa bus centre to Crumlin can set you down on the Divis Road! 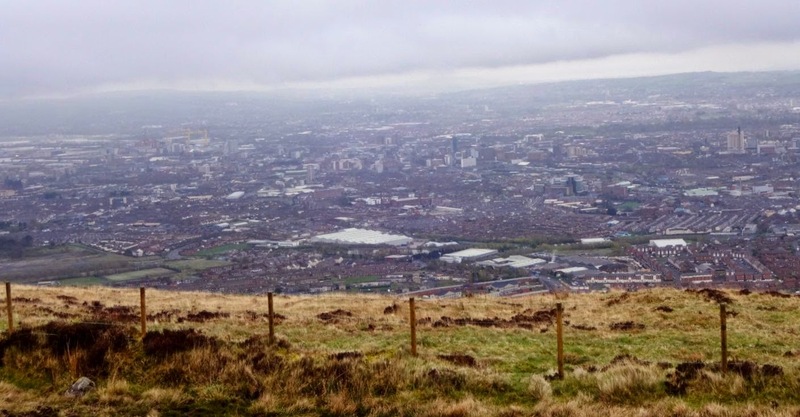 After the launch I spoke to Heather Thompson (National Trust director for Northern Ireland) and Gareth Evans (DARD) about the vision of opening up the Belfast Hills to the public and DARD’s involvement in the funding. 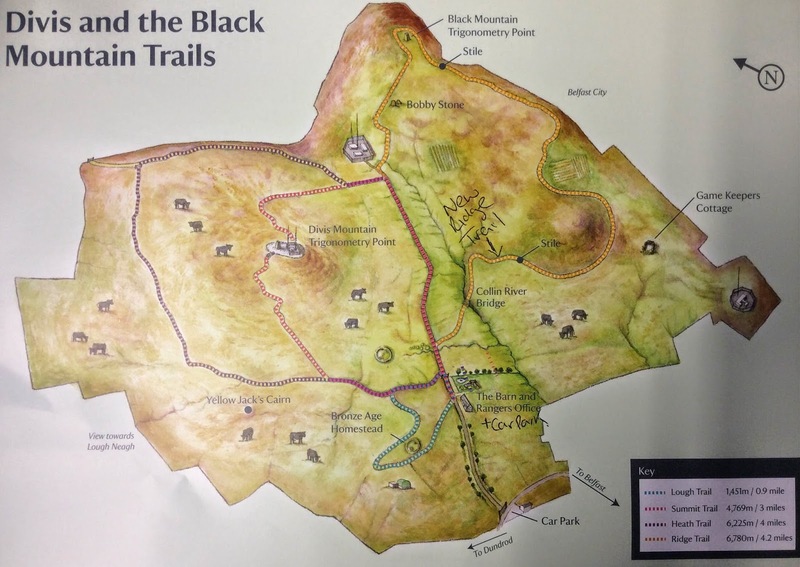 Long term, the plan is to be able to walk from the Lagan/Lady Dixon Park, through Colin Glen and up to the Belfast Hills, with paths leading across from Black Mountain/Divis to Cave Hill and beyond. There are still some gaps, but the vision is not too far off being complete. 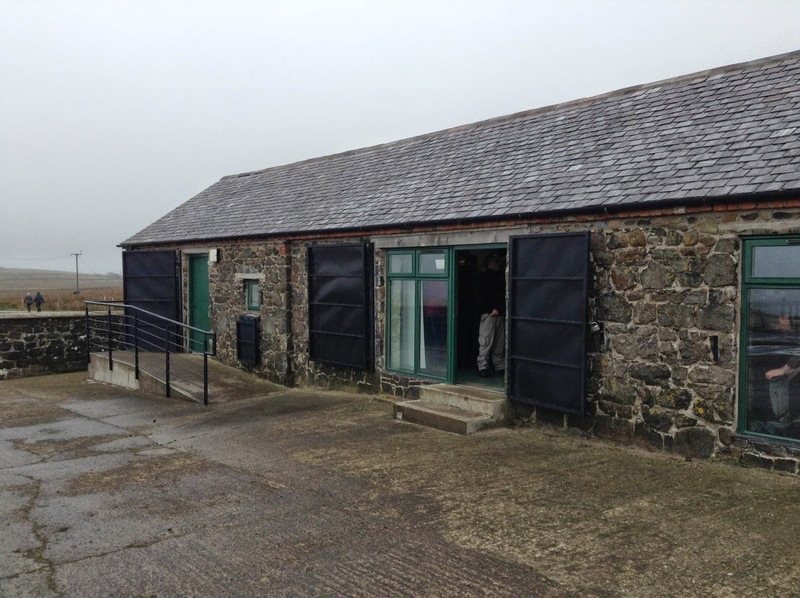 Practically, as well as the existing car park on Divis Road, there’s a new smaller car park up the lane opposite the Long Barn visitor centre (which offers refreshments too). I suspect I'll be back over coming months with family to revisit the Ridge Trail and make our way up to the summit. Update 12 May 2014 - Belfast City Council have confirmed that they'll shortly be repainting the three buoys ... and they've consulted the experts and will be painting them red and white, green (cone shaped) and black (can shaped). 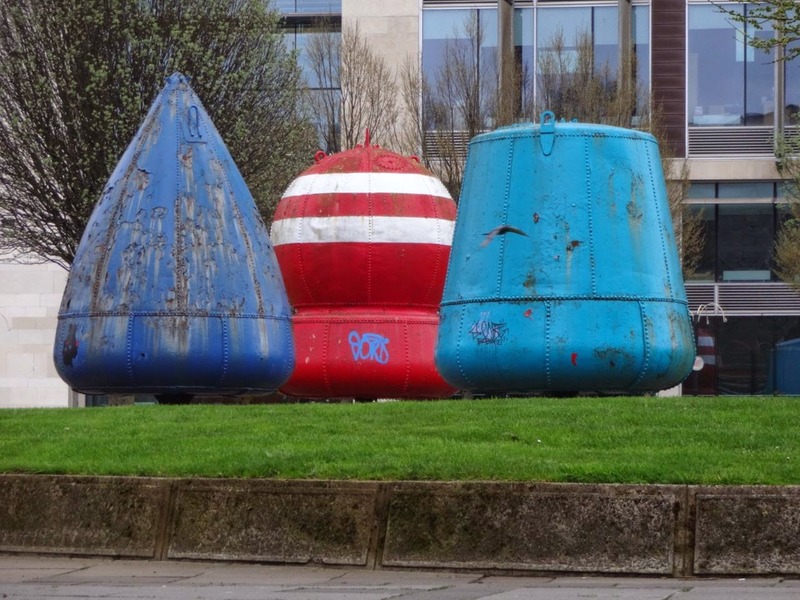 Long time readers of the blog will remember previous posts about the three enormous buoys that occupy the square beside the University of Ulster Belfast Campus and St Anne’s Cathedral. Just before the Tall Ships Festival in September 2009, I noticed a spot of repainting. 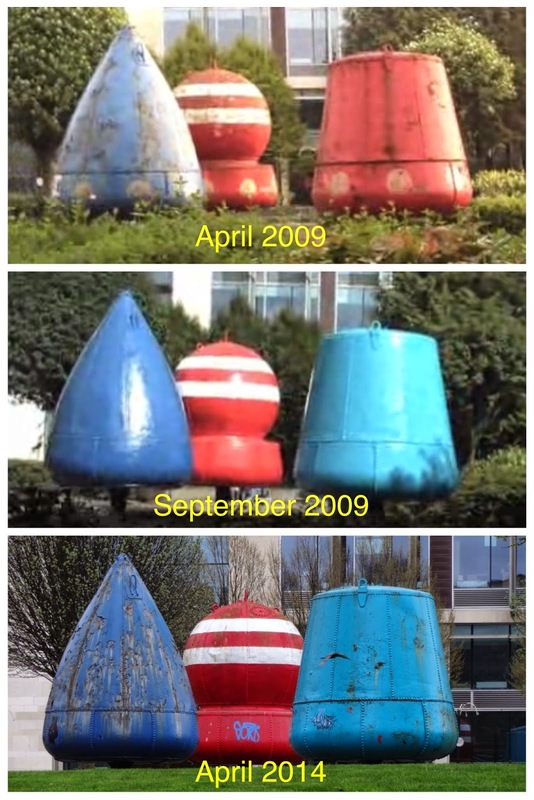 At a cost of £3,000-£3,500, the Council’s Property Maintenance Section repainted the buoys. And oddly, they changed the colour of the red flatted-topped buoy to a light blue colour. The plaque beside them explains how they came to be located on this piece of land owned by Belfast City Council. BBC journalist Will Leitch picked up on the story and ran a piece on Good Morning Ulster which discovered that while the colours had been changed, the previous colours hadn’t been correct either and didn’t strictly follow the “pre-1979 Lateral System Buoyage colours”. “The chances are the conical buoy was black. Black is a very visible colour against a sea or a sky. At the time Belfast City Council said the change of colour was “a simple mistake” due to “miscommunication” and promised to correct the colour next time the buoys were painted. Passing the garden on Saturday evening, the buoys were in a sorry state. The paint is flaking off the two blue buoys. While it’s not strictly a memorial garden, the poor state of the buoys reflects badly on the burgeoning Cathedral Quarter and the council’s respect for the city’s rich maritime history. Time to repaint the buoys … and time to get the correct colours. Who knew Thought for the Day was now broadcast on Radio Ulster on Sunday mornings too? Who knew that they'd be quite so difficult to write for a Sunday morning audience! So many ideas that – in my mind at least – might work for a weekday breakfast eaters or commuters failed to match the slower pace of the weekend (which still has some breakfast eating and travelling, but less so). Today and for the next three Sundays you'll get to hear my pre-recorded voice just before the 8am news in the middle of Kim Lenaghan's programme. These words, recorded on Thursday, turned out to be so very appropriate as I watched Sepideh - Reaching for the Stars yesterday afternoon in the QFT and listened to Jermain Jackman's inspiring victory speech on The Voice. Both Sepideh and Jermain are people who have received encouragement to pursue their dreams. Apologies if I rudely awoke you this morning, but ... Pay attention! Set people free to do new stuff; don't pigeonhole them! I spend far too many weekends attending local political party conferences and reporting about them online. Time and after time at recent conferences, speakers recounted who, when and where they were approached to get involved. Relatively few people seem to wake up in the morning and decide to become a politician. Existing party activists recognise the gifts and passion in people they meet and invite them to join their party, and lure them into running for political office. Most explain that they’d previously had no notion of becoming involved. But when they were singled out by someone they respected, they reconsidered and acceded to the request. There is power in recognising and encouraging someone’s talents. In contrast, all too often I hear of people who were told in school that they’ll never be good at a subject. One friend was told by a teacher that he’d be a waste of space and would never do anything with his life. Yet now he’s a visiting professor and runs a successful creative company that sells programmes around the world. He wasn’t constrained by his teacher’s predictions. But some people are. Maybe you were told that you’d never sing in tune, that languages would never be your thing. A negative intervention can put a student off a subject or dissuade them from learning a skill for life. They can be deterred from even attempting to appreciate music and hindered from throwing themselves into learning a language and appreciating another culture. Anyone who lives or works with other people – students, colleagues, customers, families – has a choice: either pigeonhole people, or else release their potential. God called Moses to lead the Hebrew people out of Egypt. Moses wasn’t confident of his ability to serve God like that. But God encouraged him, coached him, and surrounded him with other gifted people. He had tough times, and it took longer than anyone expected. But in the end, he did it with God’s help. Jesus called his disciples to join him. They hadn’t been to discipleship school. Some could fish. One collected taxes for the Empire. Another was an anti-Roman rebel. But Jesus invited them to step out on a new adventure and walk with him. What would happen if we set the people around us free to explore new skills and activities? Give them a chance to try out new roles even if they need a bit of persuasion. And failure can be an opportunity for growth. Oh, and if Jesus calls you to follow him, why not take him up on the offer and see where he takes you. 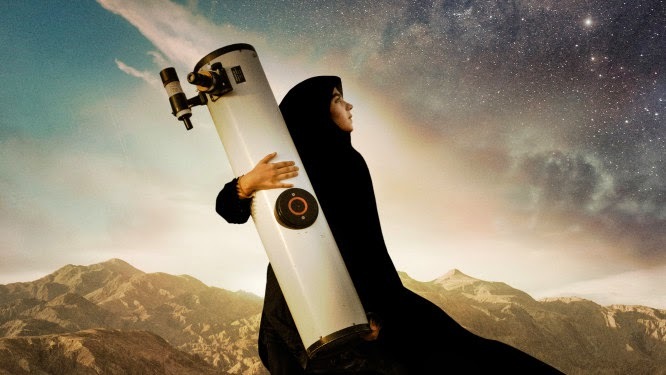 Sepideh – Reaching for the Stars is a beautiful film about a very special teenager who has a passion for astronomy. Teacher Mr Kabari runs an astronomy club for boys and girls and started to build an observatory on a hill just outside the town, 800km south of Tehran. But with support not forthcoming from the Ministry of Education the buildings were never finished and instead Sepideh lugs her 14 inch telescope up to observe the constellations. He believes in expanding girls’ minds so they know that “the world does not end at the end of the street, or the end of the block, or the town’s edge”. Sepideh’s late night trips up to study the stars are viewed with suspicion by neighbours and family. While her mother covers for her absences from family meetups and wedding parties, she is torn between appreciating Sepideh’s drive to excel, and wanting a traditional route into adulthood for her daughter. “Those who have learnt to cook – what have they become?” asks Sepideh. Her father is dead, and her uncles have not gone out of their way to take responsibility and stand in his place to help her mother. The field inherited from her dead husband is the only source of income. Yet the men in the wider family have blocked the repair of the water well. While all their fields around are lush green with produce, Sepideh’s mother’s field is brown and barren. While astronomy is her passion, the peace and tranquillity found in the open space and time outdoors is also a vent for Sepideh’s frustration. Her entry to a prestigious Kharazmi Project that could have granted her a free place in university was outright rejected. She’s not easily defeated or deflated. Mr Kabari may have spent 20 years not getting assistance from the Minister of Education, but Sepideh’s gets their support to buy a larger 16 inch telescope and accessories. Jokingly the official asks if she can guarantee to find a new supernova with it. She replies that she will, but can’t say how long it will take. Despite Mr Kabari’s reassurances that famous historic astronomers didn’t have an easy time – it was 400 years after Galileo’s death that the Catholic church changed their minds about his discoveries – he too ends up trying to selfishly constrain Sepideh’s plans and prospects. Aged 18 and nearing the end of school, Sepideh receives a marriage proposal from an older man in the Astronomy Club. He studied astronomy, has a PhD, works for the local municipality and is supportive of Sepideh’s dream. Her teacher believes that engagement and marriage will divert her attention away from the stars to more earth-bound distractions. And when she comes to Mr Kabari to explain that she needs to move on from amateur astronomy to study it more seriously at college, he conspires to clip Sepideh’s wings and expresses how let down he feels that she won’t he around as a role model for the younger students in his club. It is heart-breaking. One of the early heroes of the film exposes his feet of clay. One of the film’s devices are letters that Sepideh writes to “Mr Einstein” in her diary. But it was on the back of an email sent by Sepideh that she received a phone call from the first astronaut of Iranian descent Anousheh Ansari who paid to spend eight days on the International Space Station in September 2006. And by the end of the film we see Sepideh meeting Anousheh in Dubai and read in the closing titles that the astronaut is going to guide this inspirational Iranian women through her studies. Q: Did you know that Anousheh Ansari would befriend Sepideh and support her, when you began filming? A: No, not at all. It was a surprise. Actually, that’s why it kept taking so long to finish the film. It was already done before all this happened about Anousheh. We had finished the shooting, even the ending. Which of course now is different. It was new and made me hurry back to Iran and see what was going to happen. The last scene is shot in Dubai a year ago, and that was the first time I talked with Anousheh. While some scenes feel unnatural and staged to summarise developments and drive the story forward, this afternoon’s screening in the Queens Film Theatre on the closing day of Belfast Film Festival was a very encouraging story of hope, a zeal for learning and a yearning to make a difference. I wasn’t alone shedding a tear or two during the film. It is well worth seeing this film if it is playing in at a festival near you or is being screened on general release this summer. We need more girls (and boys) around the world like Sepideh who can dream big and dream long. And we need parents and teachers and adults to mentor young people and help them fulfil their potential.